From its humble beginnings as the final match of the 1898 VFL season, to the grand spectacle that is planned for this year's edition, the AFL Grand Final has become the most anticipated event of the Australian sports calendar. After six months of play, eighteen teams will have been whittled down to just two to fight it out at the Melbourne Cricket Ground to determine who will be crowned AFL Premiers for season 2016. On Friday night, October 2nd, (US Time) the Super Bowl of Aussie Rules football will take place. The Hawks will try to three-peat as premiers, while the Eagles will go for their first flag in nine years. Fans from all over the world will be tuning in, and you can too. Support your local club and join them as the biggest day of the footballing calendar commences from the historic Melbourne Cricket Ground. The game will be shown live on Fox Soccer Plus and WatchAFL, with first bounce at 12:30am EDT (Saturday). 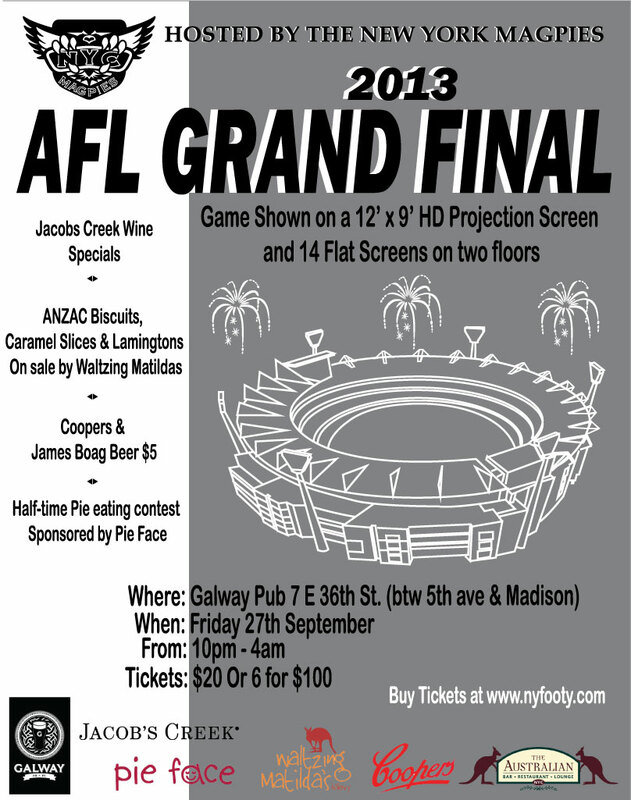 Below are a listing of USAFL clubs who are hosting Grand Final watch parties. Clubs whose parties are not listed can submit them here to be added to the list. You can also find parties across the USA, North America and the world by visiting AFL Grand Final Overseas Party Finder and the Australian Football Association of North America's Grand Final Page. Can't make it out to watch the game? Get an AFL Global Grand Final Pass and catch every second live. On Friday night, September 26th, (US Time) a new AFL Premier will be crowned. Support your local club and join them as the biggest day of the footballing calender commences from Melbourne. The game will be shown live on Fox Sports Plus and WatchAFL, with first bounce at 12:30am EDT (Saturday). Inside is a listing of USAFL clubs who are hosting Grand Final watch parties.